Summer water, orthopedic & extreme sport hiking boots protect your dog’s paws from blistering abrasions and other hazards in the heat. 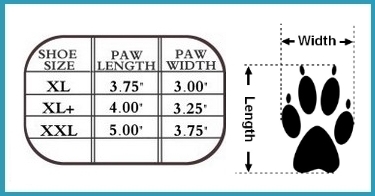 Neopaws shoes for large breed dogs are made of a breathable and durable nylon-mesh with strong rubber soles and extra reinforcement around the toe, sides and heel. They are perfect for protecting your pet while it participates with you in the many outdoor activities during the summer months, in and out of water. Neopaws will protect your pool liners and boat seats too! Also ideal for dragging paws or arthritic dogs who need help with traction indoors. The people at Neopaws, makers of dog boots believe that protecting you pooch's feetis one of the most important things you can do for your pet. If we are lucky, our dogs can live a long time and while they are living that happy life, their paws deserve to be protected from the many dangerous hazards they are exposed to. Neopaws makes orthopedic booties with conditions like degenerative myelopathy. These particular kind of Neopaws boots make it more comfortable for them when they go on their walks while protecting their toes from being injured if they drag their paws. They also keep Daisy from slipping and sliding on hardwood or tile floors. Neopaws dog shoes are perfect for protection from pollen, burrs, sharp rocks, broken glass, and road chemicals as well as hot roadways and sidewalks from hurting your dogs paws. Think about your floors and furniture when he has been out romping in the snow, mud, or rain. Pull off his boots before he comes in and your floor is safe. If your dog is a swimmer, boots will protect the sides of your pool when he clambers out. There are really so many reasons to set your dog up some boots from Neopaws, the “Nike” of dog shoes. My GSD has DM, so her back legs drag. These boots are very helpful in protecting her paws and nails. It did take a few times for her to get used to walking with them on, and a few times for me to get the wrapping down! I'm happy we have these now and would recommend them. I had the hardest time finding boots big enough for my boy. He needed at least 5 inches at the base for his 160 lb large frame. We haven't done any hiking in these yet, but the straps have stayed well with testing around home. I look forward to testing them on different terrain. These are the best made boots we've tried. Highlights: Rubber tread, solid construction, front opening and velcro placement = easy on/off. Got the XL for traction for our 12yr old Great Pyrenees. Nothing else fit well around her taller, longer paw base and double dew claws. These boots are keeping him from slipping when we go to the nursing homes with the highly polished floors and they stay on his feet. But they are doing more than that. Tugboat, that is his name, has been dragging his front feet scrapping the top of his toes. Now he has to pick that foot up or he trips. Its teaching him to walk like normal Rottweilers walk. Photos will come soon.